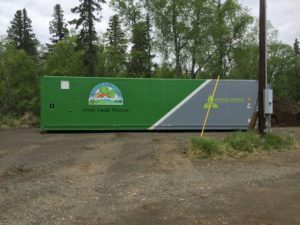 Interview (Q and A) with the founder of Belleque Family Farms – a hydroponic farm in Dillingham, Alaska. Q. What was your inspiration to start a hydroponic farm? A. I enjoy growing food already and I wanted to grow year round. Q. 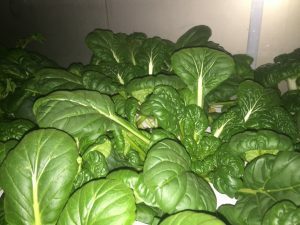 Do you have any prior experience growing vegetables hydroponically? Q. What is your experience in growing traditionally? What do you grow? A. I started growing 5 years ago. My wife’s dad taught me. Dillingham has a strong gardening culture. Bristol Bay was the first place where Russians got a strong foothold. They had to grow stuff to make food and vodka. After that, the Russians were followed by waves of Asians and Scandinavians. I currently have one acre of land. I grow organic, so I practice rotational growing. We use chicken manure and fish, guts, bones, chum salmon, ashes and limestone. Q. 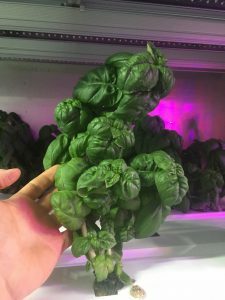 Why did you decide to purchase a system from VH Hydroponics? A. It was turnkey and that appealed to me. There is no space or time to retrofit my own. Q. What issues did you have getting started? A. Funding is a major issue for these things. Additionally, the unit had challenges starting out. I rushed to get it here and had to figure it out, but it was fishing season, so I had very little time. April 2016. 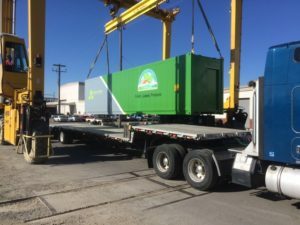 Manufacturing the Belleque Family hydroponic farm (Containerized Growing System) in Spokane, Washington. Q. Did you have to write a business plan? If so, how did you go about it? A. I have had zero experience writing a business plan. Some people who said that they would buy the product didn’t. Other people who weren’t sure about it, ended up buying it. Market research is really hard to do especially in a small community. Q. How were you able to finance this purchase? A. I financed the project with the help of my native corporation. Q. Did you have to make sales connections ahead of time? If so, what was your approach? Was it difficult? A. Farmers’ markets were the best way to get the word out about the produce. From there, I contacted the school, AC (rural supermarket chain) and the hospital. It took longer than I anticipated, because these places have never bought local and have never purchased wholesale either. Once people tasted it and saw it, they were excited about it. The hospital developed an entire corporate policy about buying local food. They got really excited about local produce. Q. How did you go about site prepping for system installation? A. I called the local contractor. We leveled the pad with gravel and the farm is sitting on treated lumber. Electric: Electric service install was a problem. I had weeks of delays getting the electrician out to run the service. That delayed the whole install. I would have lost the PCE (Power Cost Equalization, a state of Alaska program) if I plugged directly into the house. Once everything was hooked up, it worked correctly. Water: I have high-quality water, so I run a hose from the house. Once a week I top it off. A. All utilities are slow and hard to work with, especially in Dillingham. May 2016. Belleque Family Farms. A containerized Hydroponic Farm in Dillingham, Alaska. Q. How did the installation go? Can you describe it? A. Since our site prep was delayed, the unit wasn’t ready to be installed on the first trip. 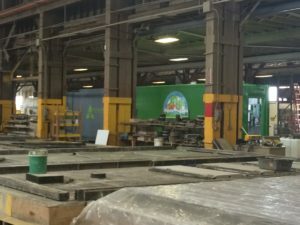 The VHH technician that flew out on site wasn’t able to accomplish a lot, because most of the site prep ended up happening during the first trip. So most of the install happened on the second trip. A. I ordered the nutrients from VHH. I sourced seeds on my own. A few other things were piecemealed as well. In hindsight, it would have been easier to order everything from VHH, because they can just load it straight into the container and deliver everything at once. Q. What specific greens and herbs are you currently growing? 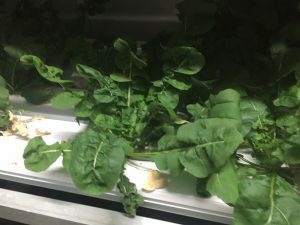 A. Butterhead lettuce, green leaf, red leaf, romaine, mizuna, ruby red chard, kale, baby Bok Choy, regular bok choy, tatsoi, spinach, arugula, basil, parsley, cilantro, summer/winter time cilantro, lemongrass, sage, etc. I have one shelf specifically for herbs. Q. How many hours do you spend in the farm each week? A. 10-12 hours a week farming. Q. What does your weekly schedule look like together with planting, transplanting, harvesting and delivering to your customers? A. I deliver on Monday, Wednesday and Friday. I plant seeds on Thursday and conduct maintenance on the off days. Some greens take longer in the grow rack, like romaine, so I have to customize the workflow a bit for that. The VHH Containerized Grow System allows me to compartmentalize and cycle my production. I use the system just like a garden. A. I don’t do packaging and I deliver in totes instead. The store puts twists ties on the lettuce. They also help out by buying bins that hold lettuce and water and plastic clams. Produce disappears by 6 pm and no one restocks the shelves. Q. Does anyone (your family members) help you with any part of this business? A. Jo (Kyle’s wife): We help with the subsistence garden – we weed and plant. The hydroponic portion is more of Kyle’s job. Our son will check on things if Kyle is traveling. But he doesn’t ask for a lot of help, because it’s his job. A. Hospital, store, school. I deliver about 400 pieces of produce per week. Q. What do you find difficult? A. The difficulty is making money selling wholesale. Growing is easy, but it is not completely like clockwork. I figure everything out, but it takes constant decision making and thinking about it. Q. Is there a demand for your produce? A. Once they come on board, there is lots of demand. Q. How do people like your produce in comparison with traditionally grown vegetables? It’s brittle and delicate, light and airy. When you eat it, it’s incredible. It’s fantastic-tasting. The definition of fresh is redefined. I underestimated how good the product would be and how much of a variety it would be. I should be selling it to Simon and Seafort’s (Anchorage’s landmark restaurant with a spectacular view of Cook Inlet, offering a classic American dining experience). 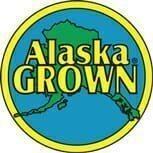 I’m producing millionaire’s food and selling it in Dillingham, Alaska. Oliver (One of the managers at Charlie’s Produce located in Anchorage) said: “I’ll buy your herbs from Anchorage.” I’ve got stuff that belongs in a 5-star restaurant. Q. Are you a satisfied customer? How do I make money with small-scale crops? I ought to buy 10 acres in Big Lake (a community about 50 miles north of Anchorage, Alaska) and do direct sales to all the restaurants. A businessman (not a gardener) with some growing skills has a better chance of succeeding, because they have to figure out how to sell. Growing is easy, selling is more challenging. The system works and grows a lot of delicious food year round. 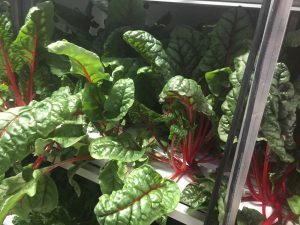 Kids and their parents are gleaning some pride that the nicest and prettiest stuff on the shelves is grown in Dillingham. Parents stop us in the community and ask to get more into schools. They are willing to pay money for it. Friends send us pictures with the food made from our lettuces. There’s a little boy in the school who only eats Belleque family farm lettuce. That’s awesome!